On May 2, 2018, MBGH recognized Le Bonheur Children's Hospital for being a 2017 Leapfrog Top Children's Hospital, 36 employers for creating and sustaining cultures of health, and shared three innovative employee engagement strategies through our inaugural "Lightning Rounds". Memphis Business Group is excited to announce that Memphis has it’s first Leapfrog Top Hospital! This has been our goal since the Top Hospital recognitions were first handed out in 2006. Le Bonheur Children’s Hospital was selected as a Top Children’s Hospital in 2017. The winners were officially recognized at Leapfrog’s Annual Top Hospital Awards Dinner and Ceremony in Washington, DC in December. 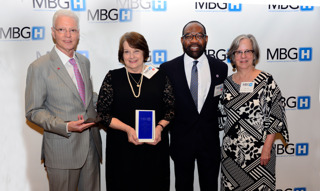 Accepting the award (L-R) were Barry Gilmore, Le Bonheur VP and Chief Medical Officer; Meri Armour, Le Bonheur Chief Executive Officer; and Michael Ugwueke, Chief Executive Officer of Methodist Le Bonheur Healthcare. 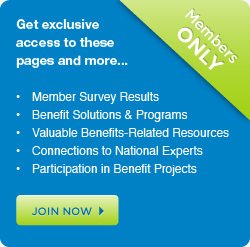 Satisfy Top Hospital Selection committee qualitative evaluation that in general the hospital embodies the highest standards of excellence worthy of the Leapfrog Top Hospital designation. To help spread the word of Le Bonheur's achievement, MBGH placed a Facebook ad that reached almost 13,000 Memphians in just one week! For the fourth year in a row, MBGH recognized employers that met the standards of our CEO Culture of Health initiative. We are so pleased that year after year we have 35-40 employers that continue their work to promote and support the health of their employees. For many, their actions also impact clients and customers, patients, families, and visitors. So the impact is even beyond their own team members! Click here to see the employers recognized this year! 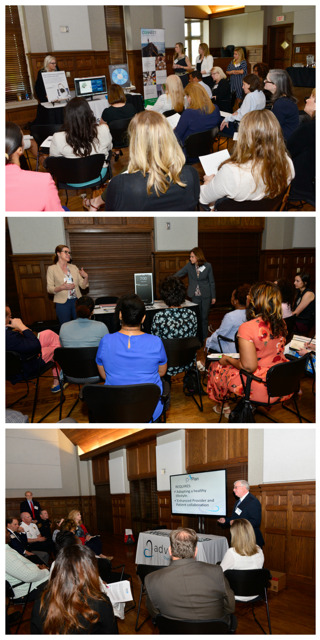 Three of our Annual Supporters (Top - Bottom) Connect Healthcare Collaboration (sponsoring LifeSpeak), WellDoc, and Adventia gave 15-minute "lightning-fast" presentations! Moving around the room from presentation to presentation in small groups, attendees were active, engaged, and had networking opportunities. They left the meeting with ideas about how to better enage their employees and freshen their health and wellness programs.